The Kaua’i Chapter began its BWTF water testing program seven years ago with the intent of providing more information to the community on where it is safe to swim and surf. 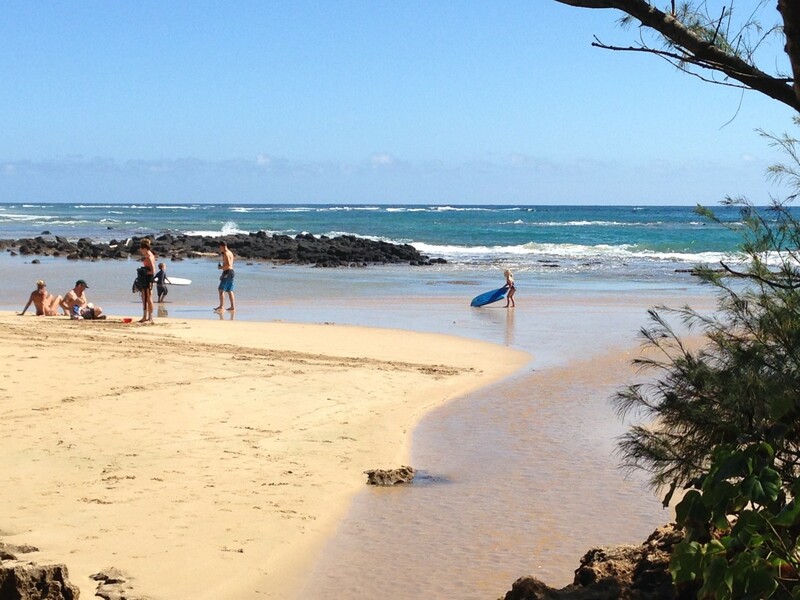 The Hawaii Department of Health (HDOH) monitors water quality at life-guarded beaches on Kaua’i, and the chapter tests 27 surf breaks, estuaries, and popular freshwater recreational sites. The Kaua’i BWTF makes their data publicly available online and emails their monthly results to chapter volunteers and HDOH and EPA staff. They also publish an annual water quality report in their local paper, and the chapter’s BWTF coordinator, Dr. Carl Berg, gives frequent talks in the community to build public awareness of local water quality issues. Dr. Berg also mentors Kaua’i Community College student internships and projects and helps local high school students with their science fair projects. Because the chapter’s water quality data has shown overwhelming evidence of chronically high bacteria levels at the mouths of several island streams, the chapter has been asking HDOH to post warning signs at these beaches for several years now. Families with children prefer the warm, calm waters of these streams as they flow across the beach, but they have no idea how polluted the water is in these increasingly dangerous recreational waters. A few years ago, the chapter was successful in getting a sign posted at the mouth of the Hanalei River and worked in cooperation with the HDOH to identify and fix failing cesspools in the watershed. 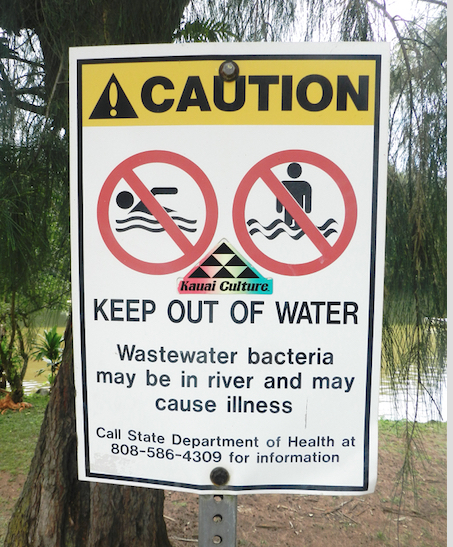 Unfortunately, HDOH has not been willing to post any further signs at any other beaches on Kaua’i, even when bacteria levels nearly always exceed the state water quality standard of 130cfu enterococcus. 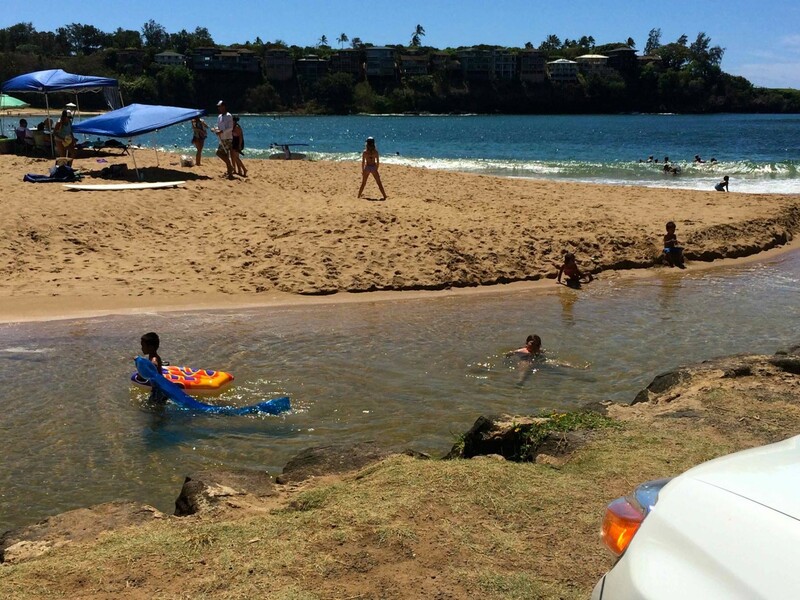 In 2015, the streams at seven of the beaches the chapter tests failed to meet the state bacteria standard over 90% of the time they were tested. Four of those streams failed health standards every single time. The most egregious site is the Waiopili Stream that exceeded health standards 100% of the time, with an average bacteria level in 2015 that exceeded 10,000 cfu enterococcus, up from an average count of 9,000 measured in 2014. That is 77 times greater that the health standard! Alarmingly, the chapter frequently sees children playing in the same exact spot that they sample, with their parents completely unaware of the health risk. Because the public health situation at the beach in Kaua’i has become so dire this past year and HDOH has not been willing to work with the chapter to protect public health and to find and fix the sources of pollution, the chapter’s campaign grew into a state and national campaign in 2015. The Oahu Chapter re-established their BWTF water testing program to determine if they have similar sites on Oahu where surfers and swimmers might unknowingly be exposed to dangerous levels of pollution. Surfrider began promoting our Ocean Illness Form across the state to gather information on any illnesses contracted in the ocean or upstream waters popular with paddlers. Surfrider also issued an action alert nation-wide to allow state residents and visitors alike to make their request to HDOH to post signs at the beach when bacteria levels are high. A close review of HDOH posting practices revealed that not only is the state ignoring the citizen-generated data on Kaua’i, but they don’t even post signs at the beach when their own water quality data fails to meet health standards, unless there is a known human source such as a sewage spill. Learn more about this campaign here or participate in the action alert here. Thus far, Surfrider’s efforts have not resulted in any improvement in the state’s public notification procedures, but a flurry of media attention generated by our campaign motivated the state to finally release a sanitary survey performed on the Waiopili Stream nearly two years ago. Unfortunately HDOH has used this document to try to justify their position not to post signs at the beach rather than making a conscientious effort to identify the real sources of pollution. HDOH falsely concluded that the stream is not used recreationally and that there are no direct human sources discharging into the stream. This despite evidence in their own report that shows the presence of human genetic markers in the stream and at the receiving Gillin’s Beach, and thousands of wastewater injection wells and cesspools and a sewage sludge application site in the adjacent area that was in use for 11 years until the state permit was pulled in 2014. Read Surfrider’s assessment of HDOH’s sanitary survey here and media coverage of this issue here. The Kaua’i Chapter has since released its own user study of one of the contaminated streams on the island that was performed by a community college student this past winter. During the study period an average of 6.7 people were observed every hour in the mouth of the Nawiliwili Stream where it discharges onto the popular Kalapaki Beach. During the same time period all water test results reported exceeded the state water quality standard demonstrating that there indeed is a public health concern. Another community organization, Friends of Mahaulepu, has also gotten fed up with the State’s inaction and have gone ahead and posted a sign at the mouth of the Waiopili Stream warning beachgoers of the contamination. The sign did not last long at the beach, but the Friends vowed in their local newspaper to continue their efforts until the state takes appropriate action themselves to protect public health. Since sound science and reason have not yet swayed HDOH to post warning signs, Surfrider has been doubling up on our efforts to build community awareness and communicating with EPA to make them aware of the egregious failure of HDOH to protect public health at the beach. If the water crisis in Flint, Michigan has taught us anything, it should be that the responsibility for protecting public health lies with us all - the community, state and local government, and the federal agencies responsible for enforcing environmental and public health standards.